Traps dirt, dust, mud, water, grime with ease. Are you a Judoka? If you wish to practice your Kansetsu Waza techniques, then there is no better way than doing it on this non-slip, over sized 6.5ft by 5ft dirt trapper floor mat. You could even karate chop your friends with a little friendly wrestling match. The dirt trapper mat actually measures 79" by 58" in size, so is technically a 6.58' by 4.83' mat (try saying that slightly intoxicated). 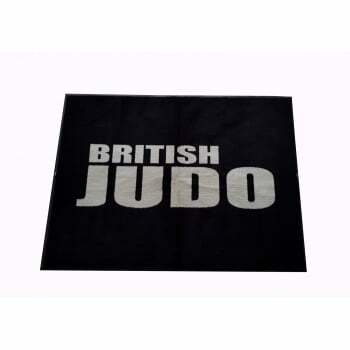 Either way, we think you get the idea that the "British Judo" floor mat is for Yudanshas (black belt warriors for us mere mortals). Perfect for a Judo fan or a British Judo club. This is an A-Grade mat, which will have some small defects or markings. The rubber boarder in intact all the way around. Please kindly note that all sizes are approximate. Please be advised that all mats sold by Splendid Pets Ltd are factory seconds or ex-commercial contract mats.